BHS students having fun during boot hockey at Neill Park Thursday. With no long breaks coming up, the holiday season past, and second semester starting, “Snow Week” is an attempt at adding some excitement to the halls of BHS. Snow Week is an activity filled, week long competition that all grades can participate in and is something many students look forward to. “Snow week is fun, wooo!” said Jocelyn Maxwell. Each Snow Week team is made up of a minimum of five boys and five girls, with an option of having up to four alternates (two boys and two girls). All competitions are double elimination. Starting Saturday morning, January 28th, all teams gather in the high school’s gym to battle for first place in the field of dodgeball. The two teams that come out on top will play the championship game at the Snow Week assembly on Monday during school. The second event is volleyball, held Monday night at 6:00 pm, again in the school’s gymnasium. Volleyball is the perfect time for people that didn’t do so well in dodgeball to redeem themselves. Two teams will compete against each other at a time, first one to 11 points wins. “Volleyball? It was fun, I only played for 3 minutes but it was a lot of fun,” said Alea Branham. Next up is boot hockey, many students favorite event. 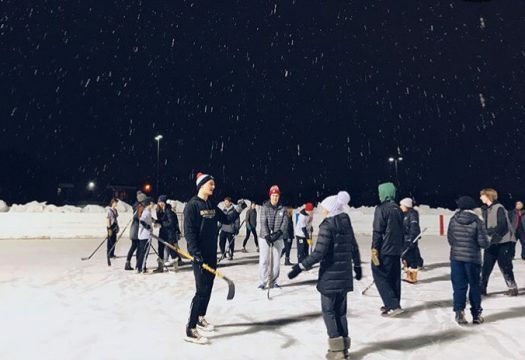 Boot hockey is held at 6:00 pm on Wednesday at Neill Park. This year it is supposed to be fairly cold, with temps under 32 degrees. Despite the cold weather, people still come since there is free hot chocolate provided in the warming house. The last, and fairly least exciting event, is team relays. Team relays happen during halftime at the boys basketball game on Friday at 7:00pm. This is the event that most teams would rather not go to, but they do anyway since they already paid $10 to participate in the Snow Week games. Students get in for free with their school IDs to the game, during halftime all the teams line up to participate in the relay, which is different each year. To top it all off, the school hosts a Neon Dance in the gymnasium on Saturday night from 8:00 pm-midnight. During the dance, the top ten ranked teams battle it out in one final (secret) event. Whichever team has acquired the most points by the end of the week is announced as the winning team – they receive no prize.